I feel funny writing to an illusory idyllic personification of the spirit of giving. But then again, I once voted Green Party. You know, when I was a kid, I remember writing letters to you and feeling absolutely paralyzed at the beginning of each letter, knowing I had to make with the idle chatter and dream up some chit-chat before getting to my greedy-little-kid wish list of the gimme-gimme’s. Now, Santa, I’ve grown up some, but not a whole lot, so you know I’ve still got a list. But, up until recently, I also had an income, so now I mostly go ahead and pick up the items I’d like, rather than making a list and hoping you, Mom and the Sears Wish Book come through for me. Them’s the facts. And it goes a long way to explaining why Dad always got so many ties and socks for Christmas. One of the things I remember asking about in that preamble to my wish list was something about the welfare of Mrs. Claus and the reindeer. I don’t recall worrying too much about the elves. I also remember (with 35mm quality image and Dolby sound) the conversation I had with The Admiral vis-à-vis the likelihood of your existence, back when I was a wee kid in flannel pajamas. Quite an evening, that. And I credit The Admiral with handling our conversation regarding the nature of illusion, the spirit versus corporeal reality, and the disappointment of deconstructed fairy tales better than he handled dating advice (which boiled down to: hold the door and chew with your mouth closed). So we’re now 2006 solar cycles Anno Domini. Christmas has more or less been celebrated for a good chunk of the last 1000 cycles, with no signs of slowing, so I have to think that’s good for business up at The North Pole. Hope the reindeer and Mrs. Clause are doing real well. I confess, Christmas this year has reminded me what a contradiction the Holiday can be. All signs point to League HQ having their merriest Christmas in years, but we’re also acutely aware of what this year has taken, not just from us, but from friends and family. And although there are lights in abundance and carols playing through every PA in town, sometimes it hits us like a tidal wave that some friends are bravely fighting sickness. And some are just working toward making it to tomorrow. But that’s what Christmas is, I think, when you pass from being the kid in the flannel pajamas to the guy in his boxers, paying the mortgage. You bundle up and sing a few carols, and try not to think too hard about who we're missing, and what it might have been in years past. And you look up at the tree and try not to ponder too hard on what a whacked out world we've carved out for ourselves. So, I try to remember: no matter your creed, the spirit of the season is giving. And that giving is done out of hope for a better tomorrow. You’ll pardon me, Santa, if I don’t mind terribly much if you skip my house this year. You know, even though I sort of think of you as that illusory idyllic personification of the spirit of giving, sometimes, this year I'm reminded that I may count on you to take it a step beyond merely existing as an ideological construct, and instead ask you to physically manifest and take care of those things which I should probably do. Wow. That really wasn’t the direction I meant to go, Santa. But as you’re an omniscient spectator of sorts (like Uatu, the Watcher! ), I guess you would have figured it out sooner or later. 2) Socks. Mine are all old. 12) the usual for Jamie. Thanks. So, thanks, Santa. I know some of these are tall orders. Especially that run on Forever People. But you’re Santa, and I know you’ll do your best. Merry Christmas, Sir. We’ll leave out some nog and cookies for you. I don't have much blogworthy at the moment. 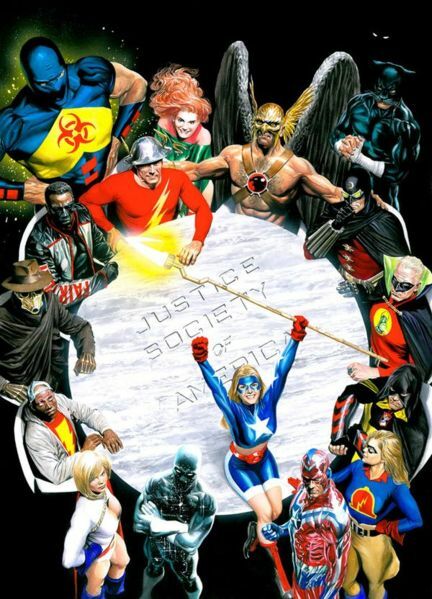 But I did want to recommend Justice Society of America #1. If you haven't hit a comic shop this week, or if you have and DIDN'T pick up Justice Society of America... anyway, this relaunch is a perfect opportunity to start reading a new book by a terrific creative team. I just received DC's "New Frontier Absolute Edition" in the mail. One of the most underappreciated comics in years. Obviously DC knew what it had, and set about getting an Absolute Edition on the shelves. I understand a lot of readers dismissed the series when it was initially released as "too cartoony". I was actually shocked at my LCS in Phoenix that the guys behind the counter had never even HEARD of the series (way to keep up with product, fellas). 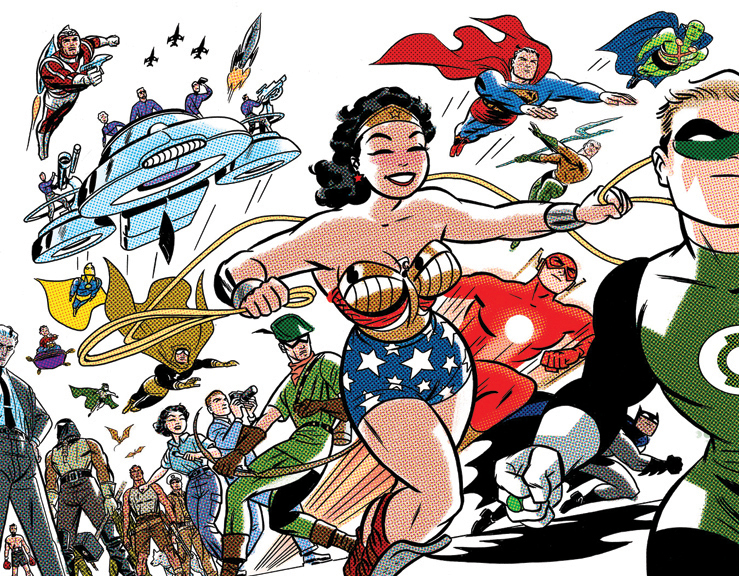 The folks who dismissed Darwyn Cooke's art as cartoony missed the point. Cooke was doing retro-stylized stuff well before The Incredibles brought it to the big screen, utilizing the stylistic trappings to capture the essence of an era. One heck of a book. And because I'm feeling good about Darwyn Cooke, why not mention the Superman comic he's currently writing (and the amazing Tim Sale is drawing). 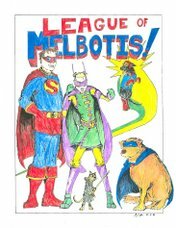 This new series tells tales from any period in Superman's career prior to whatever qualifies as The Present. Cooke and Sale absolutely nail an early-career Superman and the Planet staff. Also, their depiction of Lois is the rarely glimpsed version which reminds readers what sort of person would interest The Man of Steel. I do not post everything that comes my way. People who send me links know this. I don't even post a lot of the really funny and good stuff that comes my way. Sometimes I mean to post something and forget. Anyway, RHPT sent me something the other day that just really stuck with me. Truly an idea of unrivaled genius. And, I tell you this: as much as I've always wanted to do a multie-week trip to the Pacific Rim, this would be a deal-closer for me. To stay in the hotel in Godzilla's belly or leg would rival any other experience of my life. Nathan Cone of TPR San Antonio has sent me his review (upon my request, though I also take unsolicited reviews, Leaguers) of the Richard Donner cut of Superman II. Nathan is a connoisseur of all kinds of film, so I take his opinion very seriously. That said, Jamie, Jason and I watched the movie the other day, and I am in almost 100% agreement with Nathan. Director's cuts are a dime a dozen on DVD these days. Packaging boasts of "five extra minutes" of footage or "uncensored scenes." More often than not, the extra footage inserted into a film is unnecessary. But occasionally there is a DVD with extra footage that stands out as something special, and "Superman II: The Richard Donner Cut" fits that description. No, really. Go read it and then you can come back. I confess to finding the Jor-El scenes far more powerful in the Donner version, and especially the manner in which Superman must make his choice to "become mortal" (which doesn't have a clearly stated logic in the Lester version). The scene is far more heart-breaking, as is the follow-up scene when Clark returns to the fortress. I need to review the movie again with the director's commentary before I say much more. Jim D, what hast though wrought...? This evening Steven Harms (whom I met through JimD) invited Jamie and I out for a night of trivia competition at Mother Egan's. In the mix were Alfredo Garcia, a gentlemen I did not know, but who, apparently knows Jason from the Travis County Courthouse (where he works as a prosecutor, not because he's frequently arrested). Later, a young woman and gentleman sat down at the table, and after introductions, I learned this was Molly of the now defunct "Osakatomebaby.com", one of the earliest blogs of the now defunct JimD blogring. So, despite Steven's early departure, I ended up having a great deal of fun with four people I didn't really know. Such is the nature of a good beer and trivia (the answer was Daisy Hill Puppy Farm, not Sunny Dale Puppy Farm. My apologies.). It turns out Molly's beau (Andy, I think. It was loud in there, and I'm totally deaf thanks to NIN, circa 1991) works at Channel 8 here in Austin. I LOVE Channel 8 and watch it constantly. And as we spoke, I realized I'd seen Andy on TV doing on of Channel 8's "Web Sightings" segments just a few days ago. Also, he was with Amy Hadley (the hardest working woman in the news business) when Amy was forced to stand in the cold the other day when it was like 20 degrees out and windy. He also promised to slip my name in next time he has to host the "Web Sightings" segment. Whoo-hoo! It's the little things. So I've invited all the folks from Trivia to the Holiday Party. If that doesn't work out, post-Christmas we'll do something. In the menatime, I need to get my head cleared so I'm ready for Trivia Night once again. Oh, and NEVER fold the paper. That's a 1-point deduction. Anyway, all of this got me thinking: JimD, move to Austin. What are you doing? Why are you so far away? Move to Austin. We'll buy you a beer. This night never would have happened without JimD. So where is he? He's not at trivia night. I tell you that much. We have napkins. I think I have 60 napkins. I probably need to buy more. I also have paper plates. But, for some reason, no cups. I need to buy booze and egg nog. -2 Baskin Robbin Yule Log Ice Cream Cake Rolls. 1 Mint, 1 Chocolate Chip. -1 tray of small sandwiches. -Jamie will be providing cookies. Delicious cookies. -I will buy some olives at the HEB, because I learned the expensive way at Central Market that I like olives. If you would like to provide any additional food, please feel free to do so. BYOB is not required, but HIGHLY recommended. I have also obtained a stainless steel firepit, for which I need to obtain some fuel. Smokers banished to the back porch will now have a heat source. And a very large lighter. Also, all signs point to an appearance by Rami. And that's just good news for everyone. Weekends are meaningless when you're unemployed. We fill our days with little things to do, an endless list of tasks that, were we employed, I suspect we'd wrap up in a few hours on the weekend, then sit, looking at one another at 5:00 on Sunday, wondering where had the weekend gone? I have three boxes of toys that will find their way to a worth charity. The illusion of re-selling your "collectibles" has been burst. I had planned to have a mixed "cartoon-themed" office, throwing in my Marvel, DC, Disney, etc... stuff all in one place. It didn't work out. I'm clearing out the Spider-Man Rogues Gallery of little 6" plastic men and women. I'm ditching a handful of Spideys. The Fantastic Four won't be blankly staring at me from my shelf any longer. This is the first in what will, most likely, be several attempts to clear my closets, so to speak. I found a shop in the farthest reaches of N. Austin which would buy back toys, or so their advertisement said. On Friday, I tried to go trade-in four boxes of toys, but the owner wouldn't be around until 5:00. That equated to, roughly, a 4 hour round trip with Austin traffic, so I called back on Saturday. "What do you have in boxes?" "Not much," I confessed. "Most of it's loose." "Well, only bring what you have in boxes." I hung up. And cursed loudly. I took some items I had purchased a long time ago (but which never left the closet) all the way to Lake Creek, and traded them in. The guy was actually honest about what he was doing and gave me far more than I actually dreamt of getting. Unfortunately, it had to be in store credit. So I am now three die-cast Batmobiles richer, but far wiser. These items, they are not an investment. And, I think, in the clear light of Austin (where it's not just crazy me living in my crazy head), I know that. And that's also what's convincing me it's a good idea to get rid of some of this stuff. But I'm also no longer trying to push out the desert and the boredom. Saturday night we headed down to the lighting of the Christmas tree on the Capitol grounds. Thousands had turned out for the event, mostly families with small kids, but also some curiously well-dressed graying couples, and some very sweet, silver-haired folks as well. We dropped off our canned goods, sang some tunes along with KUT's own John Ailey, then counted down the lighting of the tree. Sang some more while perched on the Capitol's wall (John Ailey seemed baffled by "Feliz Navidad"), then walked Congress. At some point in college, the decorations on Congress became one of the things I feel obliged to tick off my list of to-do's during Christmas. There's nothing spectacular about garland and lights stretched across the street, but it's an image I have frozen in my mind of a few quiet nights, just as finals ended and the city so quiet it seemed frozen in time. Congress was not quiet on Saturday. Ballet Folklorico from St. Ed's performed on one corner, a group of young ballerinas (dressed in odd outfits intended to make them look like ornaments) handed out flyers about the Ballet Austin performance of the Nutcracker while a jazz-band played tunes from the ballet. A perfomance artist/mime dressed as an angel and came to life to have her picture taken with children. Kids were everywhere (an oddity downtown at night). And, of course, Santa rode in the back of a convertible Yellow Cab, circling the block and waving. I missed all of this in Arizona. There were the lights, but somehow Arizona Avenue and its "tumbleweed tree" just wasn't the same as Congress at night with all the folks out walking. The tree lighting and caroling was fun. We will be recruiting others for this task next year. Jamie has been at her piano almost relentlessly, preparing for the party. She is very concerned her piano-skills will not be up to snuff. She is more than ready. And she's even learned the Peanuts' "Christmas Time is Here". Tonight we headed out to Opal Divine's to celebrate the birthday of Andy S. We're starting to merge with Jason's group of pals. Fun folks, these kids. Hope they show for our Holiday Party. The weekend was quiet. This week we will be preparing for the party on Saturday. We hope you will come.